I’ve been reading Tarot cards personally (and for close friends) for nearly 20 years. 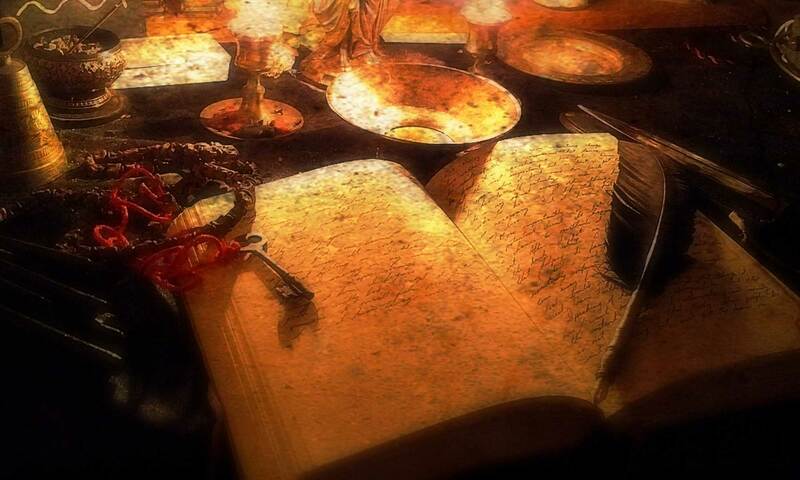 For a limited time, I’m offering Tarot readings for $5 at The Kindred Cauldron. Just drop by on Thursday, Friday, or Saturday afternoon when I’m in the shop. I’m also available by appointment on Tuesday and Wednesday from 6pm to 9pm. For extended or remote readings, the cost is $30. Send me a message and I’ll work with you to schedule a time or a remote reading. I’ve been reading Tarot and doing divination for over 20 years. My approach is to figure out the story that the cards are trying to tell. Then, we work together to figure out why the cards are calling your attention to this issue. My belief is that there are two things happening with the cards. First, they act like iron filings in a magnetic field. That is, they align themselves to the psychic and spiritual currents that are surrounding our lives. Second, we read information into them – by projecting our subconscious concerns, we see those concerns reflected in the patterns of the cards. I have two decks I’m working with right now. Queen of Pentacles, 7 of Cups, King of Cups. Uusi Pagan Otherworlds Tarot. Don’t let the empty space in this deck fool you. The artwork is evocative and otherworldly, and thick with Pagan imagery. 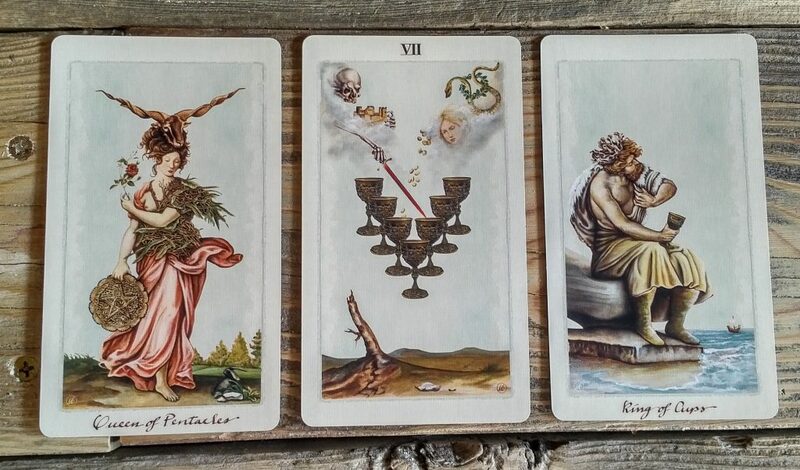 I love this deck because it steps boldly away from the traditional Christian-based Tarot imagery, and offers a view of how a Pagan might look at these themes. This deck is great for examining your spiritual path, or looking metaphorically at your life. Think big-picture type information. In the reading above, mom might be struggling with wanting more romance, and feeling stuck holding up the family finances. Dad is absorbed with his hobbies or his inner emotional world. Between them are the loves that hold them together – a child, magic, a business, but troubled by looming and pointed concerns, perhaps an illness or death in the family. Tarot de Marseilles, designed by Pierre Madenié in 1709. 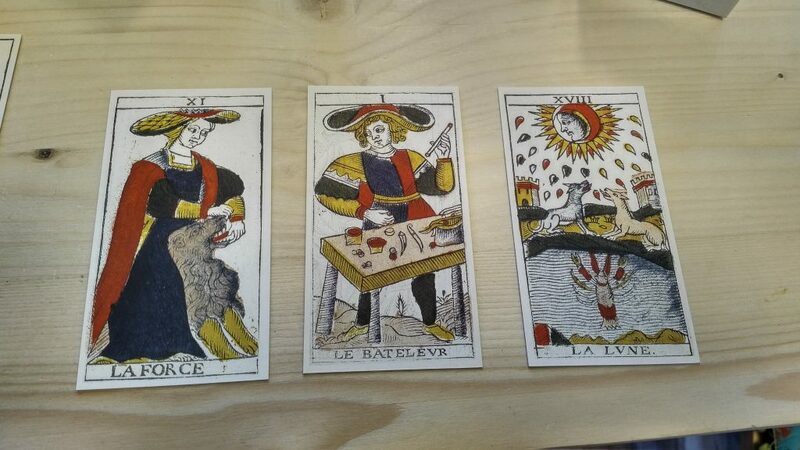 The Tarot de Marseilles has a reputation for being weirdly accurate. This is very much a real-life, day-to-day tarot reading. I use this deck for very literal interpretations. For example, the cards above might indicate that mom is wrangling an excited dog while dad is making dinner. Some of dinner spills and the dogs get it, and it’s getting late, so they decide to go out to a seafood dinner instead. You can drop by The Kindred Cauldron when I’m in the shop, usually after 2pm on Thursdays, and all afternoon on Fridays and Saturdays. We can also take appointments, if you want to message or email us at KindredCauldron at gmail dot com. You can also contact me directly, and we can work out the details.